[Lahore: 4thOctober 2013]:After the recent showcase of the collection in Lahore, Gul Ahmed, Pakistan’s leading textile group, is set to exhibitthe brand’s new Fall / Winter Collection 2013 at Islamabad Fashion Week 2013 on 6thOctober 2013 at Serena Hotel. The new collection takes its inspiration from modern trends such as contemporary digital prints and celebrates the femininity of the modern Pakistani woman. The creations have been meticulously crafted using fabrics such as digital viscose,silk velvet andpashmina embellishedwith ornate details and gilded edges. 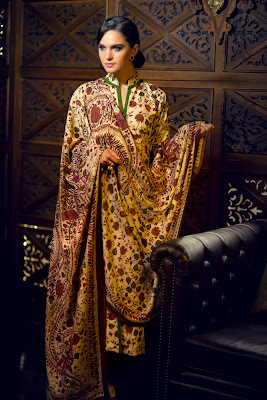 The designs also features traditional paisleys mixed with a subtle palette of darkcolours and peacock shades. The outfits in the collection exhibit a diversity of cuts and silhouettes, ranging from dresses with long lengths to less voluminous tops and palazzo pants.